When you move into your first apartment, there are so many items to remember that you are bound to forget something small or large, yet essential. A good way to avoid having to head back to the store three or four times that first weekend you move in? Make a checklist. Our first apartment checklist has everything you need, sorted out by the rooms you’ll need to be populating with new stuff. Download our first apartment checklist image above and print it out when you head to the store this August. 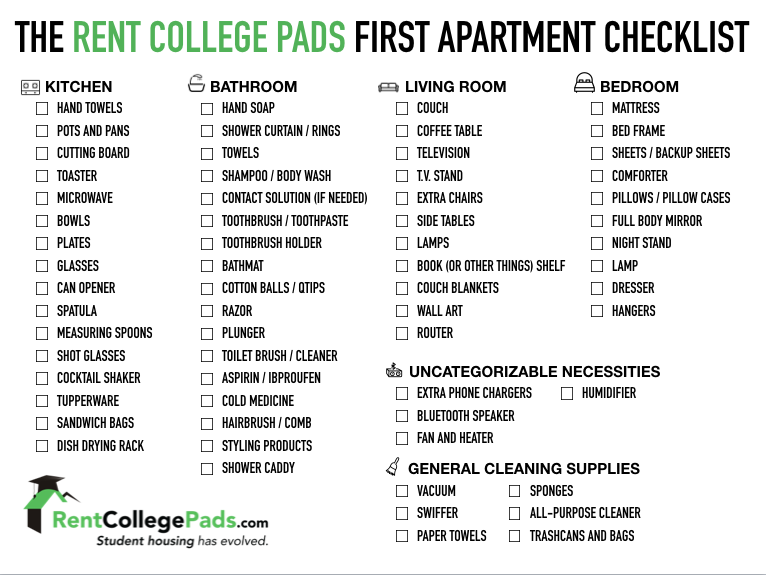 Your very own first apartment checklist from Rent College Pads. The first day you move in, you’ll want to make sure your new place is clean. The day you move out, you’ll want to make sure your place is clean. In between? Well, hopefully, you’ll at least spend a few days tidying up so things won’t get out of control. General cleaning supplies include a vacuum, a Swiffer, paper towels (buy in bulk so you save money! ), sponges, all-purpose cleaner and a few trash cans scattered around the place. We’re trying to help you think ahead about those things that you don’t think about until you need them. If we work together, you can avoid the 2 AM run to the 24-hour pharmacy desperately in need of a charger for your phone. Necessities include extra phone chargers (bonus points for a 10-foot charging cord), a Bluetooth speaker, a fan if you’re without air conditioning and a space heater (because chances are good that your landlord won’t be kicking the heat on the first day you get cold). As a college student, you’ll likely be spending the majority of your time here, asleep in your bed, debating whether or not that early morning class is worth attending. So make your bedroom experience a good one. Get a mattress that gives you some extra room to move around in and is comfortable enough that you’ll have trouble getting up in the morning. Those are the best beds. Your bedroom should include a bed (duh) and a mattress (duh), but beyond that, backup sheets, a warm comforter, extra pillows, a full body mirror (you gotta make sure you’re looking good on the weekends), a nightstand, a lamp, a dresser and plenty of hangers will go a long way towards making your bedroom everything you want it to be. You may be sharing a place with some roommates, so they could be bringing some great couch and a sick television. That’d be great. If they don’t, you can probably find a cheaper, but still big, TV on Amazon or at Target. There are tons of couches on Craigslist, just be careful about the listing you’re reading – there are as many scammers on Craigslist as there are real people. But you want your living room to be a cool enough place that you’re not embarrassed when your friends come over to pre-game. A living room should include a couch, a table, a television and stand, extra chairs for company, side tables, light sources, a shelf or two, some decorations or art up on the walls, extra blankets and a router so your roommates can still functionally be online while you’re watching Netflix. You’ll be in here every day at some point or another. You’re starting your day in the shower, you’re ending your day brushing your teeth and you’re in here a few more times throughout the day. The key to a nice bathroom is keeping it clean, organized and smelling fresh. You’ll need supplies and organizational skills to pull that off. Start with a shower caddy, that’ll save you some space in the shower itself. From there, stock up on hand soap, a shower curtain and rings, towels, shampoo and body wash, a toothbrush, toothpaste, a toothbrush holder, a bath mat, cotton balls and QTips, a razor, a plunger, a toilet brush and cleaning fluid, some headache medicine (we get the feeling you’ll wake up with a headache on certain weekend mornings), cold medicine, a comb or hairbrush and some styling products. Use the space as best you can and if necessary, buy some extra bathroom shelving. Money is going to be tight for the next couple of years. If you want to go out and enjoy yourself on the weekends, you’ll need to be smart at home. That means you’ll have to do some grocery shopping and cook some food for yourself. It doesn’t have to be anything fancy. Grill up some fish. Make a peanut butter and jelly sandwich. Microwave a potato. Cooking doesn’t take too much time, it just takes thinking ahead. And the right supplies. Get a least one good pot for boiling pasta and a pan for cooking burgers, those will likely be staples for you. You’ll also need a toaster, a cutting board, a microwave, bowls, plates, glasses, a can opener, a spatula, measuring spoons and a dish drying rack too. If you’re going to entertain at all, maybe pick up a few shot glasses and a cocktail shaker. And Tupperware. Tupperware will help you save a ton of money in the long run. It keeps your food fresh and makes multiple meals out of one. Long live Tupperware. The first thing you need though? A place to live. We should be able to help you out with that one though. 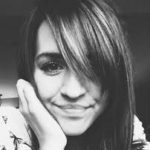 This entry was posted in Apartment Tips on June 9, 2014 by Callie Kollenbroich.